[BMH witness statements]. 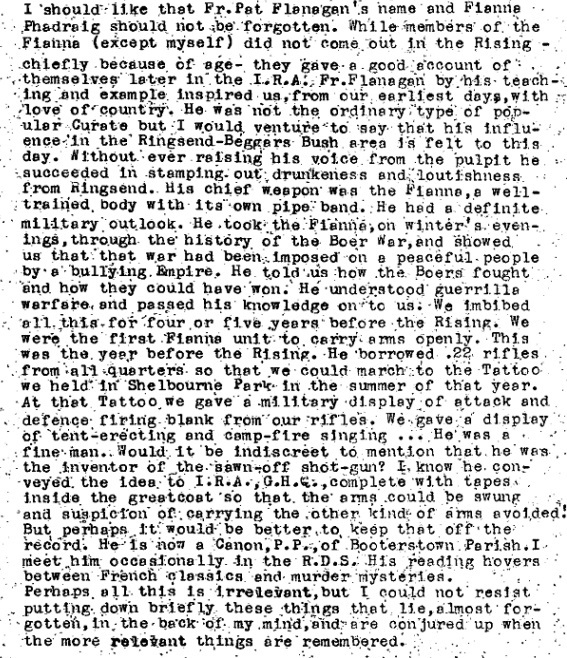 Sean O'Shea statement (about 1916 Rising), dated 1948. [BMH witness statements]. Monsignor M. Curran statement (about 1916 Rising), dated 1952. Fr. Paddy was an active supporter of rebellion before the 1916 Rising. From [Sean O'Shea statement]. born 7 April 1883, Dublin. He is listed as a curate at Ringsend, Dublin, in [Thom's] from 1909 to 1918. He is listed in [Census, 2 April 1911] as C.C. (Curate), living 12 York Terrace, a segment of Pigeon House Rd, Ringsend. Fr. Paddy was a nationalist with links to the rebel wing of the Irish Volunteers. [Sean O'Shea statement] says Fr. Paddy founded around 1911-12 the "Fianna Phadraig", an armed nationalist scout unit similar to Fianna Eireann. Fr. Paddy taught them nationalist history and equipped them with rifles. The 1916 Rising started on Monday 24 April 1916. The rebel HQ at the GPO surrendered on Sat 29 Apr 1916. [Monsignor M. Curran's diary of 1916] for Tue 2 May 1916 says that: "Some fighting is still proceeding in the Ringsend district on a small scale. Fr. Paddy Flanagan was asked by the military to try and stop it." Fr. Paddy was arrested by the British apparently on 5 May 1916 [Monsignor M. Curran's notes]. Apparently NOT 6 May. He was held at Richmond Barracks. Released apparently 9 May 1916 [Monsignor M. Curran's notes]. He is listed as C.C. (Curate), Church of the Holy Family, Aughrim St (also here), Dublin, in [Thom's] from 1919 to 1939. Listed as living 83 Aughrim St in [Thom's] 1919 and 1920. He was at George Dempsey's funeral 1924. Listed as living 70 Aughrim St in [Thom's] 1925. Listed as living 115-117 N Circular Rd in [Thom's] 1927 to 1939. He officiated at funeral of his cousin Sr. Padua 1936. He was parish priest of Booterstown, Co.Dublin, from 1939 to 1956 [plaque on wall]. He registered his sister Mary's death 1948. 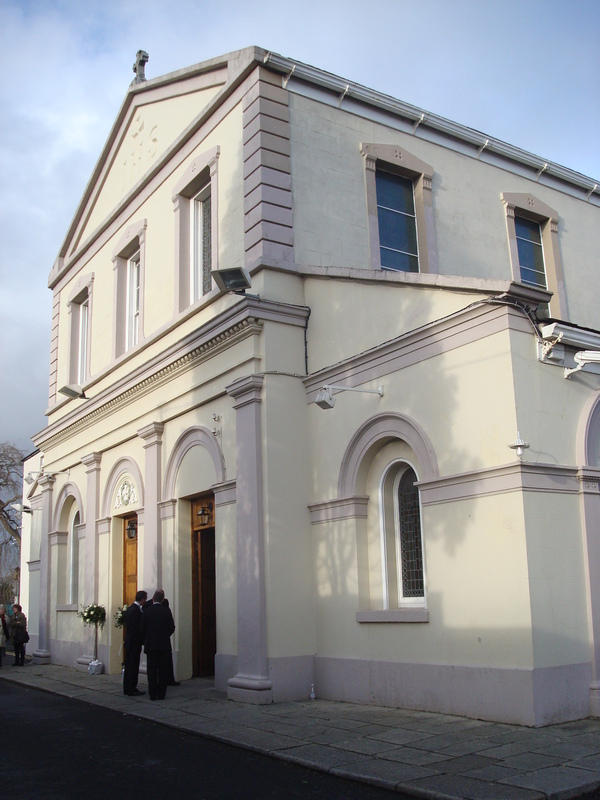 He organised the building in 1953 of the new church on Merrion Rd (which would later split off from the Booterstown parish). 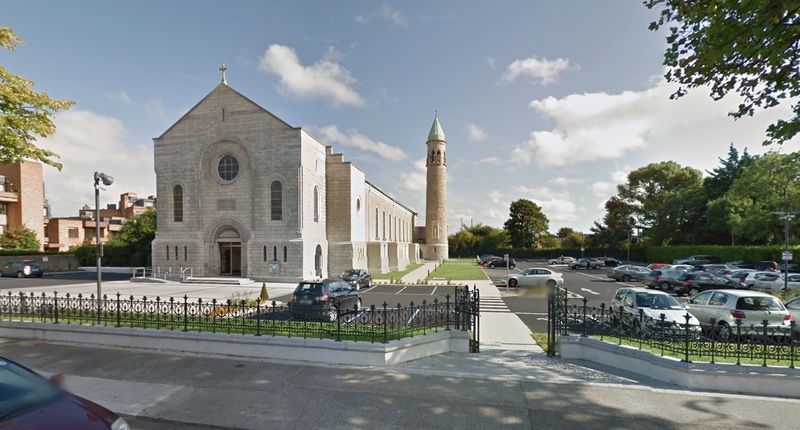 This is the Church of Our Lady Queen of Peace, Merrion Rd, with its distinctive round tower. He died 1956 [Lyng, 2000], age 73 yrs. Merrion Road became a parish in its own right in 1964. Fr. Paddy listed as Curate at Ringsend on p.1033 of [Thom's, 1910]. [Sean O'Shea statement] recalls Fr. Paddy and the 1916 Rising: "Would it be indiscreet to mention that he was the inventor of the sawn-off shot-gun?" Photo 2009. See larger and full size. From here. 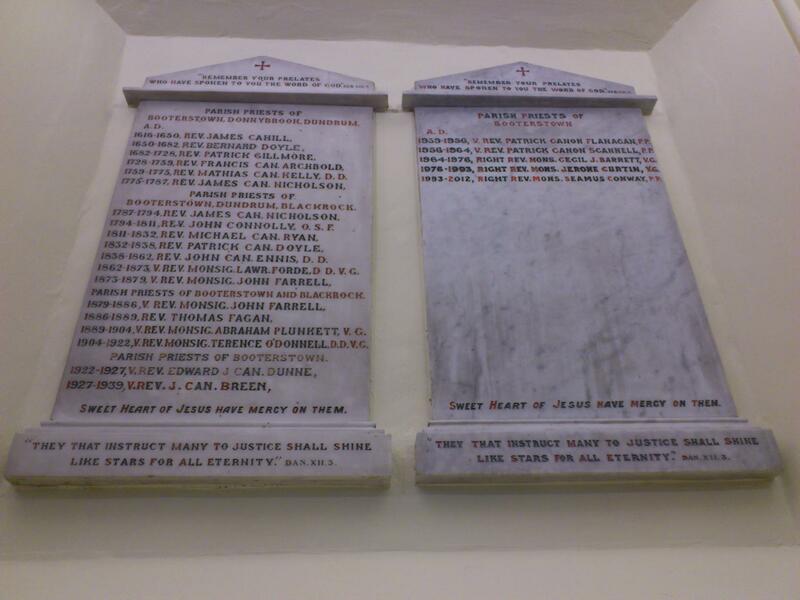 Plaque inside the church at Booterstown (on RHS) showing the parish priests, including Canon Patrick Flanagan. Photo 2013. See full size. Screenshot 2014 from street view.